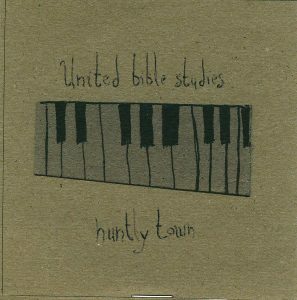 Accoridng to the only description I could find online ‘United Bible Studies is an experimental and improvisational folk band from Ireland, with members in the UK.’ I think (could be wrong) that it’s basically David Colohan of Raising Holy Sparks and a variety of talented occasional contributors, recording a pretty eclectic mix of trad and non trad folk, rural psych and drone. Whatever it is specifically, it can be very good indeed. Given that, this mini album is definitely from the more trad end of the UBS spectrum. It’s a mix of traditional folk ballads and original tracks, and begins with An Cailín Gealach (‘The Irish Girl’), which is in Gaelic and which, consequently, I understand barely a word of ((it does dip briefly into English, incidentally, as the singer presumably quotes an English speaker), but it doesn’t matter; there’s something in the quality of the singing which makes the meaning of the lyrics less important than the sound of them. The next track ‘With Ravens On Our Wrists’ is the first instrumental, a pleasant if fairly standard slice of rural folk enlivened by the switch to a jig in the last forty seconds or so. If I was being a bit arty, I’d say these instrumentals work a bit like sorbet at a posh dinner – cleansing the palate for the next song. And the next song in this case is perhaps the most traditional song on the album – ‘The Roving Ploughboy-O’. Don’t be put off by the ‘-O’ though, even if it suggests that Rambling Sid Rumpo is about to launch into song. With something of the air of the 90s Alisdair Roberts, it’s a straight-forward, and excellent, version of the traditional ballad, played ans sung without much ornamentation. The best of the original tracks, entitled ‘Ghostwritten’, follows. I don’t know if this was recorded live, or if the muddy vocals are deliberate but either way it works well for me. It’s a short song (only 01:42) with minimal backing and a pair of voices, and leads into my personal favourite song on ‘Huntly Town’, a version of one of my favourite folk songs, ‘Bogie’s Bonnie Belle’. The singing is fresh and sweetly done, the instrumentation lush and layered, and the combination – listen out for the little crescendo as the narrator and Belle let their feet slide away down by the banks of Cairnie – is one I could listen to over and over again. The finest version of the song I’ve heard. The album closes with ‘Pillars of Cloud’, another almost intrumental guitar piece, with just a quiet chat by an unknown elderly artist, content with his position in the world and wary of the effects of power, dropped into the background.